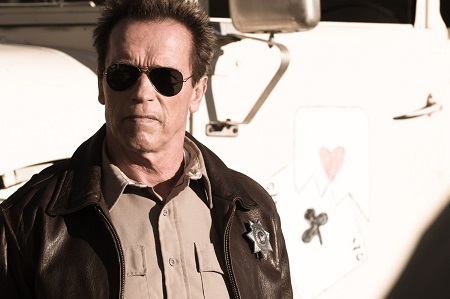 Not counting his glorified cameo in The Expendables, and his much longer one in The Expendables 2, seeing he was spending time as the governor of California it makes sense that we haven’t seen a lot of Arnold Schwarzenegger on the big screen of late. His last starring role was back in 2003’s Terminator 3: Rise of the Machines, and before that were a series of subpar actioners including Collateral Damage, The 6th Day and End of Days. As the new millennium dawned it was increasingly clear that the former action kingpin was coming to the end of his run, so moving from Hollywood superstar into a political career made a weird sort of sense. But now the 65-year-old former (and maybe future, if you believe the buzz) barbarian named Conan is attempting to make the transition back from politics into the world of cinematic action heroics, and he’s enlisted Korean wunderkind Kim Jee-woon (The Good, the Bad, the Weird, I Saw the Devil) to help him do it. 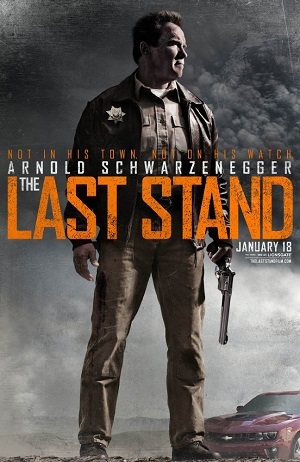 The pair’s robust, cartoonish thriller The Last Stand certainly doesn’t break any new ground, and it definitely doesn’t do a single thing that’s unexpected, but that doesn’t make it any less a rollicking good time. Say what you will about Schwarzenegger but the man does know how to make a fun action movie when he sets his mind to it, and for all its faults his teaming up with Jee-woon has produced a very entertaining one indeed. The plot is straight out of a black and white Hollywood Western. Sommerton Junction Sheriff Ray Owens (Schwarzenegger) is informed by FBI Agent John Bannister (Forest Whitaker) that escaped Mexican cartel warlord Gabriel Cortez (Eduardo Noriega) might be speeding towards his quiet burg in a quest to get across the border. This doesn’t come as a surprise to the veteran, in large part thanks to the presence of lethal badass Burrell (Peter Stormare) attempting to shoot up his officers as if they were clay targets at a deserted gun range during an early morning confrontation. Ray could stand down. He could allow Cortez to race through this Arizona town and go back to Mexico. But Ray is a man of honor, and no one waltzes by on his watch, especially when they’ve already had their bloodthirsty minions inflect deadly force upon those he’s sworn to serve and protect. Outnumbered and outgunned, this sheriff and his small band of misfit deputies won’t go down with a fight, the dusty streets of Sommerton Junction about to become a battleground few who are around to watch the skirmish are likely to ever forget. The Last Stand is loud. It is obnoxious. It is more often than not hilariously nonsensical. It is a comic book come to life, the outlandish theatrics behind Cortez’s escape from FBI custody in Las Vegas and his subsequent foray onto forgotten American highways driving a souped-up, high-speed sports car just plain silly. 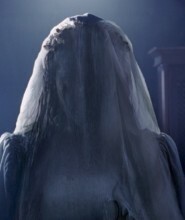 But the movie also knows exactly what it is, who it is made for and what it needs to do, delivering the hard-hitting goods in a fashion that gets the pulse racing. It’s High Noon meets Extreme Prejudice meets Assault on Precinct 13 meets any one of a dozen John Woo Hong Kong thrillers, all of it mashed together through Jee-woon’s eccentrically whimsical sensibilities, thus creating a bloody smorgasbord that’s uniquely delightful. This is all to the well and good, the blood-drenched finale involving Ray and his merry band taking on Burrell and his cutthroat cohorts a hoot and a half. The action is relentless, has a visceral kick, Jee-woon and Schwarzenegger playing things a tongue-in-cheek yet somehow also maintaining a matter-of-fact seriousness adding much needed gravitas. 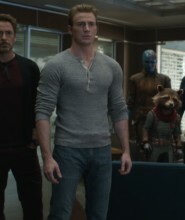 No matter how odd things gets, no matter where the joke is placed, when the guns get drawn and the fists start flying the impact of what is happening never dwindles, allowing the movie to accelerate unlike any other of the actor’s efforts in what feels like a good two decades, maybe longer. Coming in at about 107 minutes the whole thing does feel a little padded. All of the stuff revolving around Bannister, the FBI and their worry over one of their own getting kidnapped by Cortez (a bored looking Genesis Rodriguez) goes nowhere, things stalling out whenever any of the various nondescript subplots come to the forefront. It’s also no secret as to where things are headed, the climactic moments as preordained as they come. But for my money The Last Stand pays off, and had I paid the price of a matinee tickets it’s doubtful I’d been disappointed. Schwarzenegger, embracing both his age and his iconic history, doesn’t so much reinvent his cinematic wheel as he does get in spinning back once more in the right direction, this cartoonish modern day B-grade Western a giddy throwback I happily enjoyed far more than I should probably admit.